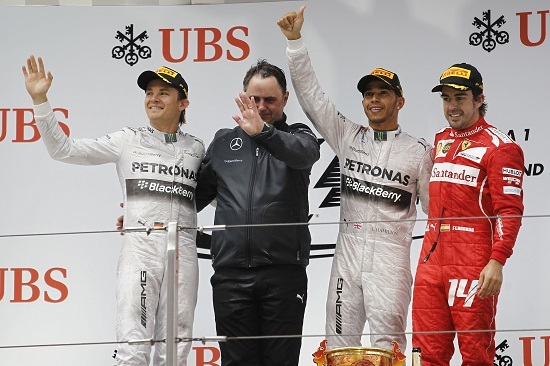 A dominant Lewis Hamilton took to the top step of the podium again today in China for the third time in a row! His string of victories, and the pace of his Mercedes over the rest of the field looks a bit ominous at the moment, but I’m sure that as we head into Europe things might get shaken up a little. 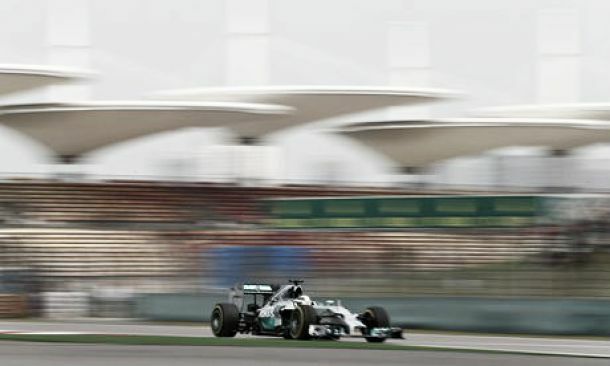 Hamilton lead the race from pole position, and never once had to check his rear-view mirrors (there was little danger of anyone getting anywhere close – even his teammate Nico Rosberg was 18 seconds behind him); meaning that he is now within four points of taking the lead in the Championship from Nico. Rosberg is looking a little bit more sober this weekend, despite having finished in second place, as the Championship lead starts to slip away from him, and Hamilton continues to be so dominant in the team’s performance. Possibly Hamilton is getting inside Nico’s head, but I’m sure that he will be able to bounce back to form soon. Nico also suffered with telemetry problems during the race, forcing him and his engineer to do things old-school style. Third place finisher Fernando Alonso looks to have discovered the magic button to make the Ferrari go faster this weekend, after what has been a week full of upheavals for the team with Stefano Domenicalli resigning, and new man Marco Mattiacci taking the helm. The Spaniard also found his demon-start abilities again, despite taking a knock off of Felipe Massa’s Williams going down into turn one. It’s a pity that Raikkonnen, finishing down in eighth, has not yet discovered the magic fast button, but I think Europe again will prove to be a turning point for the Finn. Ricciardo is constantly surprising me this season, and in the best possible way. His performance in the car is outshining his four-time World Champion teammate and he has finished in front of him for a second time in succession. Life looks to be a little bit difficult for Vettel at the moment (dare I say he may actually have to work a bit this season), and we almost saw a repeat of the Multi-21 disaster with Vettel refusing to allow Ricciardo through. However, the young Aussie passed him with little effort, and then sadly left him quite far behind. If there had been another lap of the race I think we would have seen Ricciardo on the podium instead. Ricciardo came home in fourth, with Vettel finishing in fifth. Nico Hulkenberg took sixth place for Force India with the Williams of Bottas taking seventh place, and his teammate Massa languishing down the bottom of the grid after a first lap collision with Alonso and a very poor pit stop by the team. Felipe seems to be one of the unluckiest drivers on the grid, but I hope that his luck soon changes! Force India’s Sergio Perez and Torro Rosso’s junior Daniil Kvyat, in his last race as a teenager, took the last of the points up for grabs. The McLaren duo, who looked so dynamic at the start of the season, seem to have lost some of that sparkle now that the season is settling in. Button finished down in eleventh place, and the rookie Magnusson finished in thirteenth. Knowing McLaren they are working desperately hard to try and resolve any problems that they are having, but I think they may be running out of time. Lotus also continues to flounder a bit this season, with Grosjean retiring from the race with gearbox problems and Maldonado finishing in fourteenth place (impressive considering he started at the back of the grid – but not impressive enough I’m afraid). 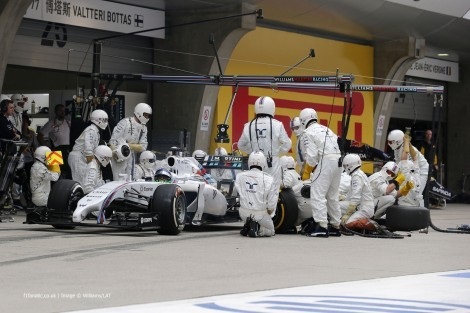 Fail of the Day: The Williams Pit Crew of Felipe Massa for effectively destroying any chances he had to finish in the points.